For many of us (myself included! ), there's one book that we immediately think of when it comes to thieves in fantasy: Lynch's The Lies of Locke Lamora. So Among Thieves draws an obvious comparison - both are set entirely among criminal society, and both feature rather... enterprising protagonists-on-the-run. 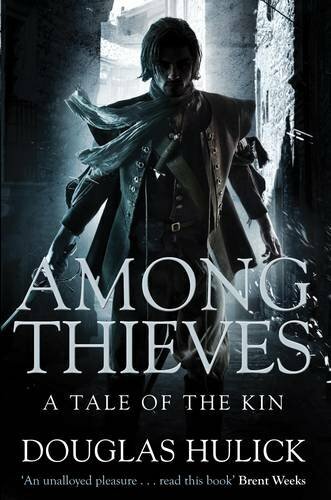 So the question here will have to be: is Among Thieves as good? In many ways, yes. But first, let's get to what it's about: the thief. Drothe, by name - a Nose, or gatherer of all-round information, rumours, conspiracies and everything else for an Upright Man: Nicco. And he rapidly gets out of his depth - like in Lies, there's the threat of war as we learn that somebody's plotting a gang conflict in a cordon known as Ten Ways. And with nobody willing to pull out, an Imperial relic missing, and rumours that a Grey Prince - one of the Kin's controlling figures - is in the driving seat, Drothe and his partner, a mercenary by the name of Bronze Degan, have a mess on their hands. In fact, it's much more than that: betrayals, magic (or 'glimmer'), and the history of the empire all play their role. Degan, a mercenary. Though they don't amuse us as much as, say, the Dresden/anyone duo, or Locke's crew, there are still a few humorous moments: and what we can see of Degan makes him a nice touch. Unfortunately, the rest of the cast don't get their moments yet: nobody stands out as an engaging third or fourth in our character parade. ...Though we can probably let this go - this is a faster, snappier read than most fantasy, and like with the Dresden Files, characterisation of the full cast has to wait! What about plot? Well, it's... Surprising - I'll say that! Drothe doesn't escape the consequences either (which, as I discussed yesterday, definitely ups the novel). Would I recommend Among Thieves? Yes - it's a small investment for a tightly plotted novel which reads like a younger Butcher writing fantasy crime. This is fantasy with an edge: fast, rapidly escalating, and for once actually makes us sympathise with the betrayer. I already had this one on my wishlist so I'd remember to keep an eye out for it (I'm horrible at remembering authors and titles when I'm actually at the bookstore if I don't have my list! )...I'm even more interested to find a copy now! I also have Lies of Locke Lamora on my bookcase at the moment, and you just made me even more excited to read that too, lol. Lies of Locke Lamora is fantastic - I'm sure you'll enjoy it! I have to admit, my personal preference is for Lies over Among Thieves, but both are good reads in the subgenre. :) Thieves, conmen... Always fun to read! I've been seeing this book around - mostly while I kept an eye out for Ancient Blades trilogy book two, Honor among Thieves, which I'm supposed to be reviewing. It's also about a thief, quite morally grey, whose organization also kind of falls on his head and... I disgress. What I actually meant to say is, Among Thieves seems to have the feel of good old fantasy but perhaps be better construed than Ancient. I don't know how serious it can be if compared with Dresden, but since in general lines that's a character I love (whenever he's not surrounded by yet another hottie...) I think I should read this one. Well, I don't compare it with Dresden in the sense of the narrative or narration - more in the sense of protagonist stumbling around hopelessly out of his depth on fantasy-caffeine-substitute (some kind of seed here, as I recall), etc. You know, the usual formula. Im also a sucker for the thief/spy character in fantasy, and finished this book about a month ago. I thought it had a really strong opening and middle, but the end felt kind of generic and rushed. I also couldn't help but compare Drothe and Degan to Locke and Jean. Other than that this was a good debut and I would gladly read a sequel! Really? I kind of liked the compromises made, but I suppose they didn't match the created expectations - though I did think what happened to Drothe and Degan was a good addition: as I' fond of saying, consequences are important!